We perform cosmetic eyelid surgery, or blepharoplasty, in Kansas City to improve the look of the upper eyelids, lower eyelids, or both. Sometimes called “eye lift” surgery, the procedure can reduce drooping, excess skin around the eyes that can create a tired or puffy appearance. Patients are often surprised how this simple procedure that requires little downtime can have such a big effect on their appearance, helping them look younger and brighter. To find out how eyelid surgery by one of our Kansas City surgeons can reawaken your appearance, request a consultation online, or call our office directly at (913) 451-3722. 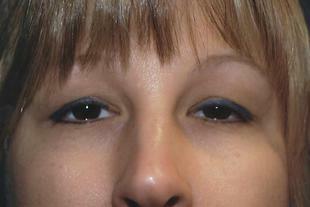 This 38-year-old woman looks awake and refreshed after her blepharoplasty. 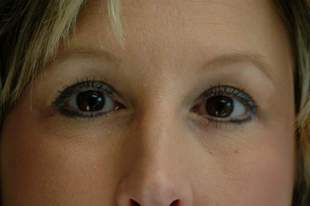 View more photos of our eyelid surgery patients in our photo gallery. You’ll begin the process with a consultation with one of our surgeons. During this meeting, you’ll be asked many questions to ensure you’re a good candidate for the procedure. Be prepared to discuss your medical history, family history, and lifestyle, as well as the potential risks associated with your procedure. You’ll also be asked to undergo lab testing and a brief physical exam to ensure you are healthy enough for eyelid surgery. If you’re considering eyelid surgery, it’s essential to inform your doctor if you have any eye diseases such as glaucoma, thyroid diseases including Graves’ disease, cardiovascular disease, high blood pressure, circulatory disease, or diabetes. In general, our surgeons prefer to perform eyelid surgery using local anesthesia and sedation. Your eyelid surgery will be conducted at our office or a licensed surgical center within the Kansas City metropolitan area. Depending on the specifics of your surgery, your surgeon may make an incision in the natural contours of your upper eyelid, lower eyelid, or both. Once the incisions are made, your surgeon removes or repositions tissue according to your aesthetic goals. Finally, your surgeon meticulously closes your incisions with sutures. Following all of your doctor’s instructions is essential to a successful recovery. Once your surgery is completed, you must keep your head elevated at all times until the initial swelling has subsided. Most patients find it comfortable to sleep in a reclining chair or in bed with several pillows. You’ll also need to wear sunglasses to protect your eyes from bright light, sun, and wind. This ensures that your incisions heal undisturbed and lessens the risk of scarring and infection. During your healing process, you’ll likely experience some swelling, bruising, irritation, or dry eye symptoms. Normally, discomfort can be controlled with medication, cold compresses, and topical ointment. You’ll need to enlist a trusted loved one to drive you to and from the surgery and stay with you throughout the first night. Most patients are able to return to light activity within a few days of surgery. For many people, this includes returning to the office. However, if your job is especially physical or visually demanding, you may require a bit more time at home. During your consultation, your surgeon gives you a more specific timeline for your recuperation. Initial wound healing may take 5 to 10 days, at which time you may resume wearing contact lenses. How do I know whether I’m a good candidate for cosmetic eyelid surgery? To ensure a successful recovery, we recommend that all surgical patients be nonsmokers who are in generally good health. Ideal eyelid surgery candidates are adult men and women who have healthy facial tissue and muscles. They should also have specific and realistic goals for their results. If you’re also interested in remedying crow’s feet or concerns related to your brow or forehead, you may wish to consider a forehead lift in conjunction with or instead of your eyelid surgery. We may also recommend non-surgical treatments such as BOTOX® Cosmetic injections. What are the long-term effects of eyelid surgery? Final results develop gradually over several weeks. It may take up to a year for incision lines to fully refine and fade; although healing varies. Diligent sun protection and consistent use of dark sunglasses are essential for helping your results last. Will the results of my eyelid surgery last forever? Although eyelid surgery can be expected to correct certain conditions, it does not stop the aging process. Lifelong sun protection, including the use of sunglasses, will help to maintain your results. Cost depends on whether you choose upper or lower eyelid surgery, or both, as well as several other factors based on your unique needs. We are happy to provide you a detailed quote for your customized procedure at your consultation. We are also pleased to offer financing options to help you fit your procedure into your lifestyle. To learn even more about how eyelid surgery can restore your eyes to their youthful selves, request a consultation online or call Associated Plastic Surgeons at (913) 451-3722.